Iowa Learning Farms partners with Water Rocks! 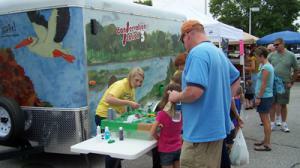 to bring audiences the Conservation Stations—three mobile learning centers that educate audiences of all ages on different conservation aspects. 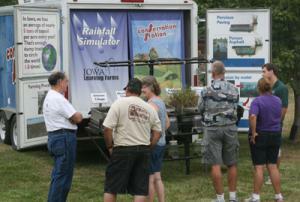 The Conservation Stations travel the state visiting field days, county fairs, farmers markets and outdoor classrooms. It is staffed by the Iowa Learning Farms team and is available for single-day events. When visiting outdoor classrooms, the team uses age-appropriate learning modules about soil, water quality, and wetlands for grade school, middle school, high school and college students. The Conservation Stations house a rainfall simulator demonstrating the effects of rainfall on undisturbed soils with a variety of soil covers and impervious and porous surfaces. The Conservation Station may be able to be part of your event at no charge. To request a Conservation Station visit, complete the Online Form. For more information, visit www.waterrocks.org. The Water Rocks! team reserves the right to select which trailer will be at your event. The video below shows Matt Helmers, Department of Agricultural and Biosystems Engineering at Iowa State University, demonstrating the relationships between land management practices, surface runoff, subsurface drainage, and sediment/nutrient transport with the Conservation Station's Rainfall Simulator. This video offers a sneak peek of the Conservation Station's educational opportunities.